The 2015 Air Elite BBCOR bat is a hybrid (composite handle, aluminum barrel) bat with a balanced swing weight. This is the second year that RIP-IT has produced a two piece bat and it is a slight upgrade to the very successful and well received 2014 Air Elite. (Other 2015 RIP-IT Bat Reviews are found here: 2015 RIP-IT Helium BBCOR, 2015 RIP-IT Air Elite, 2015 RIP-IT Air, 2015 RIP-IT Senior League, 2015 RIP-IT Reviews Catalog). The 2014 had a very gradual neck. Our experience was this gave a lot of hitters more success on contact made outside the sweet spot. Some report the ball exit speed on this bat is more consistent throughout the barrel than other over-sized barrels that dribble to the pitcher outside the sweet spot. We don’t have the technicalities to measure that stuff for the 2015 models (maybe one day!) but as far we could guess from our time in the cage there is probably some truth to that. The 2015 Model keeps the gradual neck of the 2014 model. Those looking for a boat oar at the plate might find the Air Elite lacking—but those looking for what is probably the most consistent barrel on the market should be pretty happy with the bat. As well, the 2015 model keeps the same weight distribution as the 2014 Air Elite. 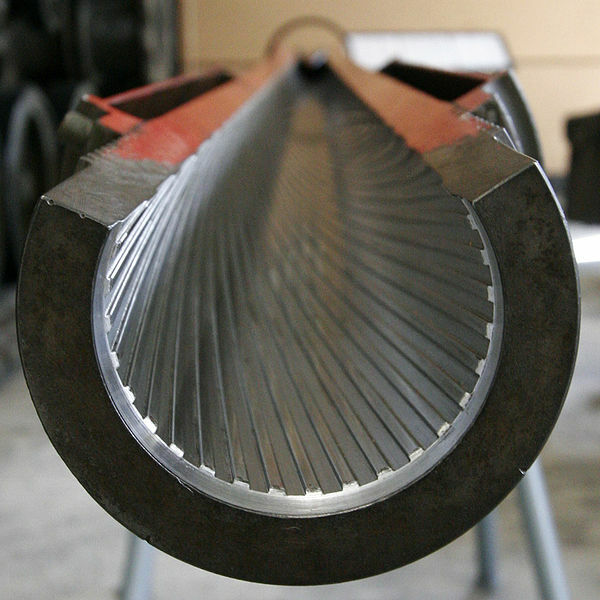 The inside of the barrel has a grooved spiral like the inside of a rifle barrel. This allows engineers to control the swing weight without the usual disadvantage that aluminum barrels lend to heavier swing weights. The bat swings very similar to Sluggers 715/Raid models–which is balanced. It is not as light as some composite and handle loaded bats like the CF7 or S1 but not nearly as heavy as the XL1 or Voodoo FT. Of interest, it has, at least by our measurements, a heavier swing weight than its full aluminum little brother (the 2015 Air). Maybe most importantly, RIP-IT kept their best warranty in the business. It is a 400 day unlimited return as well as a 30 day love it or return it (with free shipping) policy. You have to buy it from an authorized vendor (like these guys) to get a valid receipt. But with a 400 day warranty and a 30 day love it or return it policy as liberal as theirs, its hard to not just pull the trigger and take it to the cage for a couple weeks to see if its all its cracked up to be. Overall, the bat really is a hitters bat without frills or fancy names. It’s a balanced bat that is shaped like a baseball bat, feels like a baseball bats and made for hitters who accept the reality that good players are made in the cage, not in the aisle’s of sporting good stores trying to wade through the minutia of connective pieces and rotating handles. If you are a player or coach who just wants a bat that feels, looks and hits baseballs well and consistently along all parts of the barrel then the 2015 RIP-IT Air Elite, with it’s very liberal 30 day return policy, is the place to start. It fits more in the base hitters realm than the home run hitters realm although I am sure the right hitter could dial in some tape measure shots with this shtick..
I’m not quite sure I’ll ever become accustomed to $400 baseball bats. But it seems like new top shelf pricing now starts there. I’d suggest, considering its likeness to the 2014 version, maybe taking a stab at a new 2014 version (with valid receipts to still take advantage of the warranty and love it or return it policy) while the supplies last. Otherwise the best place we’ve been able to pick up this bat new (and ones like it) is here. And hey, if you don’t like, just send it back and spend your $400 elsewhere. We would recommend this bat to hitters who: Prefer a balanced swing; Prefer hybrid bats; are unsure of what to do and are willing to take advantage of the no risk return policy; Are hitters in the 1, 2, 3, 6, 7, 8, 9 hole; are not on a budget. We would NOT recommend this bat to hitters who: Prefer a composite barrel; Prefer a very light swing or an endloaded swing; are in the 4 or 5 hole; are on a budget.